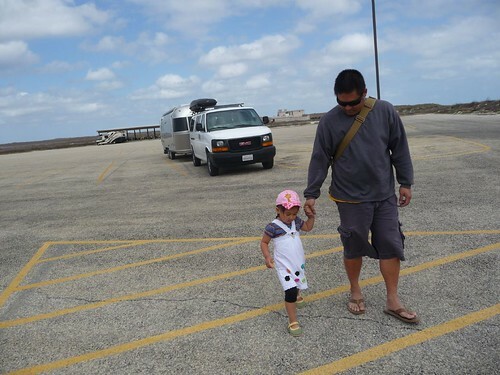 Mali Mish – Day 23: Padre Island and a RV Resort in Port Aransas, Texas. 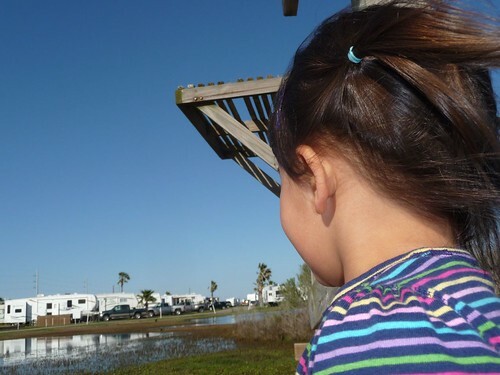 Day 23: Padre Island and a RV Resort in Port Aransas, Texas. We got into Corpus Christi, TX pretty late the night before and found a Walmart to boondock at for the night. It was our first night of boondocking since replacing the house batteries in Tucson. I wanted to make sure it was working properly and it would handle our power load when we are not plugged in. The last time we boondocked in Tempe, Arizona, we woke up in the morning with not enough electricity to even run the fridge on propane mode. Our new batteries on the other hand performed like rock stars all night. They provide enough juice to let us even run our TV in the morning for Ava to watch PBS kids before we left for Padre Island with power to spare. 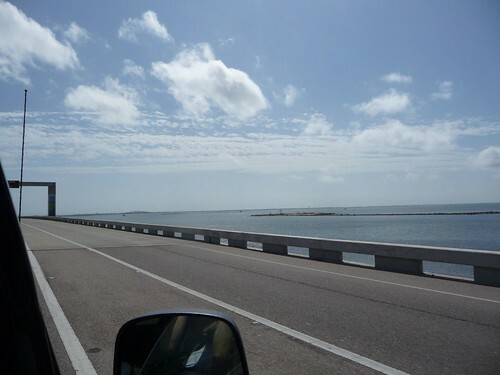 Padre Island is just a couple miles outside of Corpus Christi across a land bridge. We had finally made it to the Atlantic ocean. More specifically it is the Gulf of Mexico part of the Atlantic but it was a milestone in our minds. 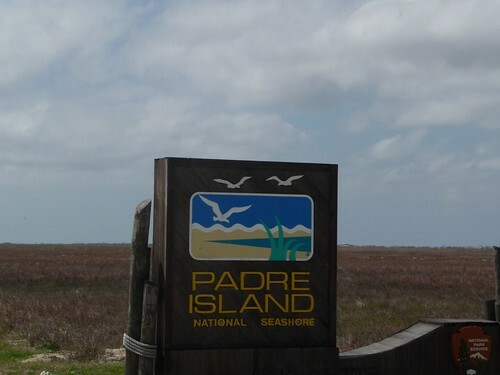 Padre Island is a beautiful place and if you drive towards the southern tip of the island, you will end up at the Padre Island National Seashore. During this time of year, this place gets really windy. Apparently today is considered a ‘calm day’ but it was not what I would consider comfortable. Our friends Claire and Daniel stayed here last night at a camp site right on the water with no hook ups. They had barely any phone reception so we came here to rendezvous with them without any ideas of where they would be. The park service attendant told us that there are 70 miles of seashore and many of them are potential campsites. Great. Being part of the National Park system, we decided to buy the annual pass for $80 instead of the $10 day pass in order to enter the park. I am sure it will more than pay for itself by the time we are done with our little trip. We pulled up to the visitor center and found a nice gift shop and views of beautiful stretches of beach that we haven’t seen in over 3 weeks since we left the California. 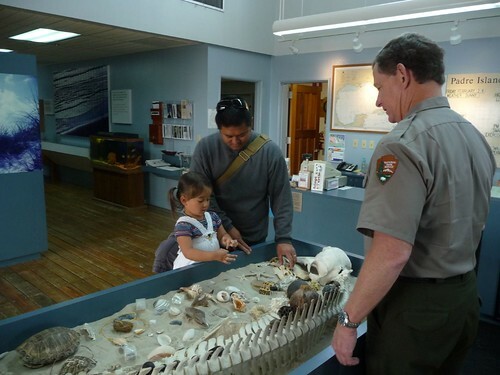 Ava loved playing with the sea shells and other touchable objects they had on display in the visitor center/gift shop. We headed down to the beach so we can dip our feet officially into the Atlantic ocean. 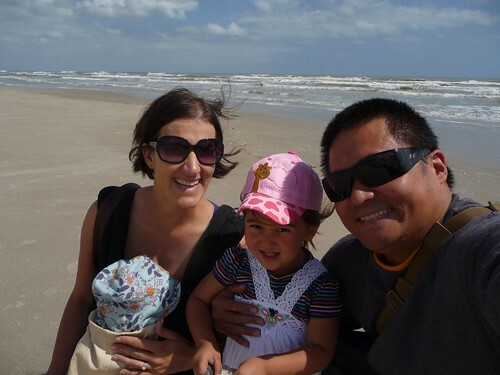 And take our official family self-portrait on the beach. Right near our rented Galveston beach house. Say cheese! 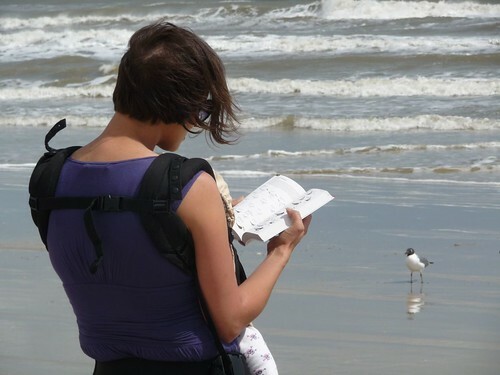 On Padre Island, Marlene busted out her bird identification books and binoculars and got to work. 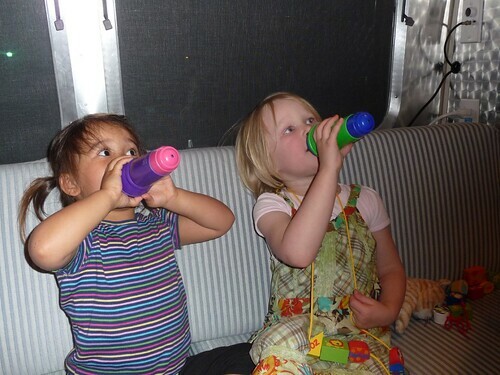 I bet she can give a full review of each binocular she has as they are the most important tools for her. Being on lots of wetlands and marshes, there are bird habitats and sanctuaries everywhere on the island. She was in paradise. We got back to the Airstream and made a quick lunch before heading back out. 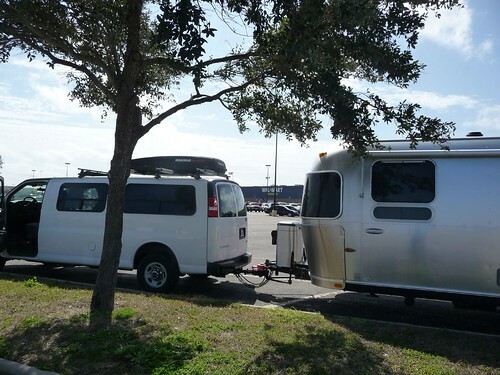 We did not know where Claire and Daniel would be and since we could not get them on the phone, we thought maybe heading to the next campsite, Pioneer RV Resort in Port Aransas would be our next move. 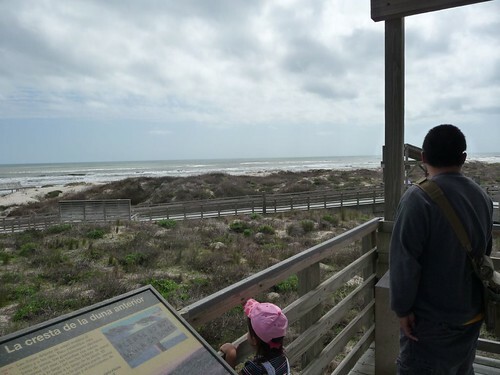 Before we left Padre Island National Seashore, we decided to drive by main campgrounds just to try out luck. 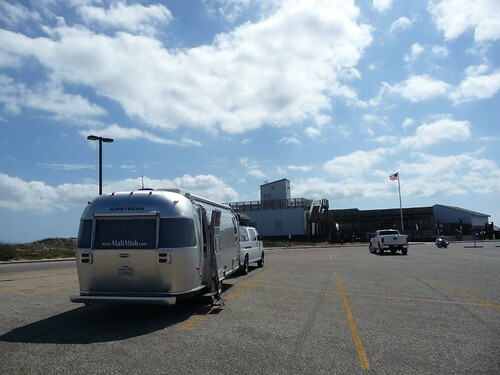 As we passed all the monstrous 5th wheels and Class A RVs, their little vintage polished Airstream appeared at the end of the campground along with that fire engine red GMC Suburban. Even though there are no hook ups of any kind, it is a beautiful place to camp. There is a dump station and water refill station just around the corner so if you had solar panels or a generator, you can spend a few days here pretty comfortably. Being only $8 a night, it is a hard deal to pass up. Unfortunately, the poor phone reception is a deal breaker for us. Plus we had reservations at a RV Resort down the street and we didn’t want to leave them hanging. 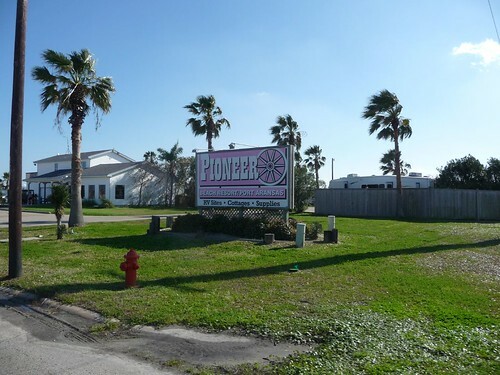 When we arrived at Pioneer RV Park just outside of Port Aransas, TX, we saw just rows and rows of concrete slabs loaded with monstrous RVs. 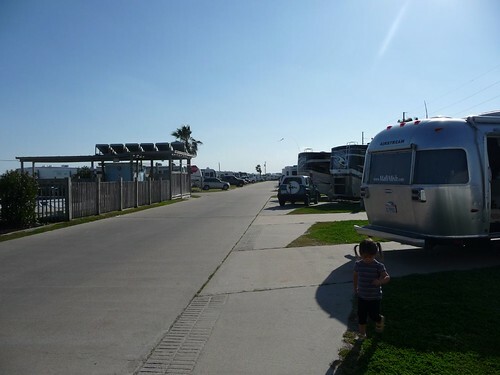 It’s not our usual cup of tea to stay at RV Resorts but we obliged to the reservations we made and paid $42 bucks a night for a pull-thru site and the extra $8 a night they demanded for the ‘extra guest fee’ that our barely 3-year-old toddler apparently qualifies for. 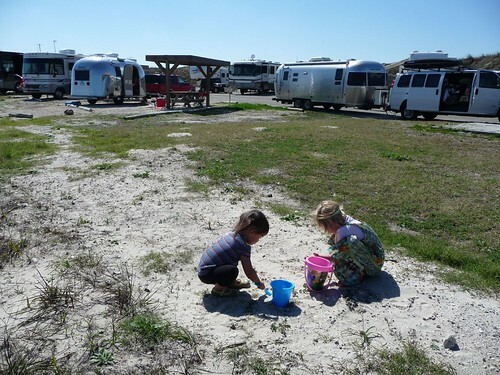 The amenities and activities are what is attractive about RV resorts to visitors who go to them. Unfortunately we don’t quite fit into their prime demographic. Most people here are of retirement age and have been here for weeks for the entire winter season in their class A RVs or 5th wheels. We stuck out like sore thumbs with toddlers and infants running around our silver clad Airstreams. We walked into the rec room just to check out the place only to find that it was decorated for a ‘hoe down’ party later in the evening. We were instantly approached by a man looking like he was in charge of the party who promptly stood in our way and asked us what we were doing there. I guess we needed tickets for this shindig and although they were free, they were all out of them. We didn’t feel completely welcome in our overpriced concrete pad with plugs at $50 a night, we hunkered down and decided to spend a couple of nights here since refunds are apparently not in the vocabulary of the ladies working the front office. At least the marsh in the middle of the resort provides a nice bird watching area. 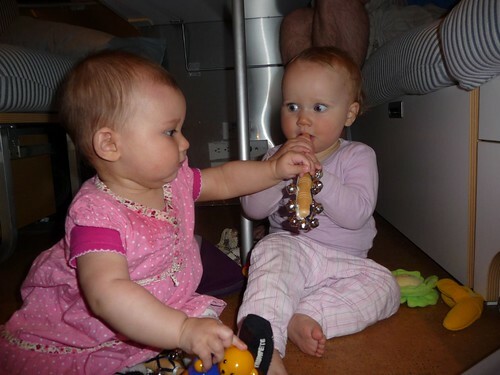 And the girls can always entertain themselves inside our trailer. Day 22: Alamo and the San Antonio Riverwalk. Day 24: Downtown Port Aransas.